1. The 4 Stages of Maturity. This is an important framework to understand. 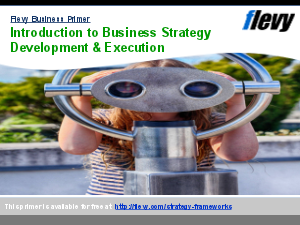 For each stage, we cover strategic implications on organizations depending on their market position and general guidelines for all organizations. 2. Strategic Planning Approaches. There are 3 common approaches to Strategic Planning: Vision & Goal Based Planning, Issues Based Planning, Integrated Planning. Concepts covered are critical in the overall understanding and successful implementation of a Strategic Planning process. It is important to note that the approaches and typical needs noted in each category are not necessarily or exclusively restricted to that category alone. Additional concepts covered include Maturity-Competitive Position Matrix, Business Growth Curve, Market Positions, Competitive Profiling. This document can be used as a supplement to our other document available on Flevy, The Complete Guide to Strategic Planning. Anthony Gable, MBA, is a Strategic Planning Specialist. He has been advising individual owners, executives, and profit-center (SBU) heads and their teams on the strategic planning process since 1983. Prior to that, he gained management experience from years of wide-reaching exposure in the corporate sector as a manager and executive.